Δελτίο τύπου: «Orion's Reign are back with their second full-length studio album, "Scores of War", set for an October 19th release by Pride & Joy Music. The album, engineered, mixed and mastered at Fascination Street Studios (Powerwolf, Arch Enemy, Dragonforce, Amorphis etc. 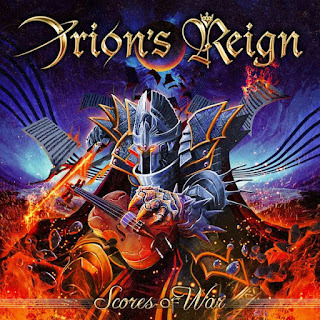 ), in Sweden by Jens Bergen, Linus Corneliusson and Orion's Reign, includes 11 tracks of epic/symphonic metal. The band continues the music path it had already begun with the previous album "Nuclear Winter", offering this time a full symphonic experience profoundly influenced by epic movie scores, with a complete orchestra, bombastic rhythms, massive choirs and guest appearances such as Tim Ripper Owens (Judas Priest, Iced Earth), Bob Katsionis (Firewind), Mark Boals (Malmsteen) and others.